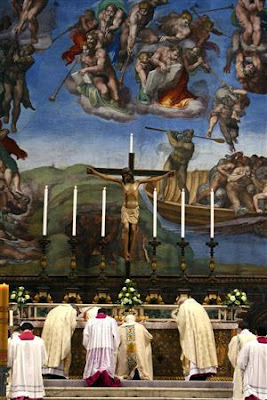 Yesterday the Pope celebrated a Novus Ordo Mass in the Sistine Chapel using the old altar and celebrating ad orientam. The story was picked up by Reuters (here is original, which is of limited usefulness). It is sad that the pope celebrating a Mass ad orientam is so rare that it is newsworthy. But this is a great example for Novus Ordo priests. Benedict is saying, "Hey, you don't have to be doing the Traditional Latin Mass to celebrate ad orientam. It is for both forms of the Roman rite." Many often forget that the rubrics of the Novus Ordo call for an ad orientam posture (which the article ignorantly calls "turning his back on the congregation"). This may be part of the much talked about spill-over theory: that the return of the Tridentine rite will spill over into the Novus Ordo and cause more dignified celebartions of the Mass of Paul VI. We shall see. 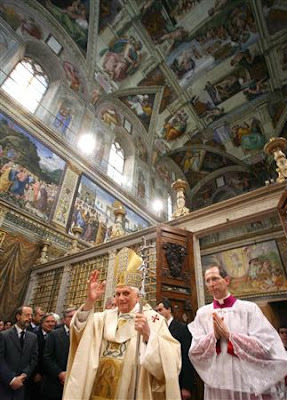 Here's some pics of the Sistine Chapel Mass, at which 13 babies were baptized personally by the pope using a golden sea shell. This is a great sign; actions speak louder than words. Viva il Papa!